There was plenty of drama and intrigue regarding this summer’s free agent class, highlighted by All-Star power forward LaMarcus Aldridge signing with the Spurs and the DeAndre Jordan saga, which ultimately left the Mavs fuming and the Clippers rejoicing. It’s no secret that the Wizards have been clearing salary-cap space to make a run at the Washington, D.C. native. The Mavs, Lakers, Heat, Knicks and Nets are other teams expected to make a spirited run at Durant. Several other suitors are likely to surface in the Durant sweepstakes by the time next summer rolls around. Of course, it’s no lock that Durant will change uniforms. If he fully recovers from the foot injuries that plagued him last season, Durant could lead the Thunder to their second appearance in the NBA Finals. The dynamic duo of Durant and Russell Westbrook now has an interior scoring threat with the presence of Enes Kanter, and Serge Ibaka is still around to provide rebounding and defense in the middle. A deep playoff run, perhaps even a championship, could convince Durant to stay right where he is. Thus, our question of the day is as follows: Will Kevin Durant re-sign with the Thunder or will he change uniforms next summer? If he leaves, which team has the best chance to land his services? Take to the comments section below to share your thoughts and opinions on Durant’s future. Note: Since these Shootarounds are meant to be guided by you the reader, we certainly welcome your input on the topics we present. If there is something you’d like to see pop up here for a discussion, shoot us a message at hoopsrumorsmailbag@gmail.com. The Mavericks have seen encouraging signs from Deron Williams during informal workouts, Tim MacMahon of ESPNDallas.com tweets. Williams, who appears lean and quick, feels he has a lot to prove, MacMahon adds. Williams signed with the Mavs in July to be their starting point guard after he secured his release from the Nets via a buyout agreement. He received a two-year deal worth $10MM that includes a player option. An overflow crowd packed a Milwaukee City Hall meeting as the public was given its first opportunity to formally comment on a funding plan to build a new Bucks arena, Greg Moore of the Associated Press reports. Milwaukee Development Commissioner Rocky Marcoux laid out how the city plans to generate its $47MM share of public funding for a new arena and entertainment district, primarily through special tax districts, Moore continues. While a majority of those who spoke favored the plan, a group called Common Ground questioned why the city would help pay for the project rather than invest in the neighborhood or school improvements, Moore adds. The Celtics extended their exclusive affiliation with the D-League’s Maine Red Claws through the 2017/18 season, Adam Himmelsbach of the Boston Globe reports. The Celtics became Maine’s lone affiliate and took over its basketball operations in 2012. Last season, the Celtics assigned a total of six players to the Red Claws, Himmelsbach adds. The Lakers will “probably” sign one to three more players before training camp, a league source told Mark Medina of the Los Angeles Daily News. That will apparently include Marcelo Huertas, who agreed to a one-year deal with the club on Monday. Metta World Peace has also discussed a contract with the team, Medina adds. Vlade Divac has been named Vice President of Basketball Operations and General Manager of the Kings amid a number of front office personnel moves announced by the club via the team’s website. Divac had been hired in March as the club’s VP of Basketball and Franchise Operations. Mike Bratz has been named Assistant GM, Roland Beech was hired as VP of Basketball Strategy and Data Science and former Kings player Peja Stojakovic was announced as Director of Player Personnel and Development. Austin Rivers has signed with ASM Sports, according to Liz Mullen of the Sports Business Journal (Twitter link). Andy Miller and Andrew Vye will represent the Clippers guard. Earlier in the day, Broderick Turner of the Los Angeles Times reported that Clippers teammate DeAndre Jordan had dropped Relativity Sports agents Dan Fegan and Jarinn Akana as his representatives. The top three picks of the 2012 draft have already established themselves as top-level talents during their first three seasons. Top pick Anthony Davis quickly emerged one of the league’s crown jewels, a budding superstar who agreed to a max entension with the Pelicans at the eve of free agency this summer. Michael Kidd-Gilchrist has become the Hornets’ defensive linchpin, and the two parties agreed on a four-year, $52MM extension this summer. Bradley Beal and the Wizards have not come to terms on a extension, but he’s one of the most feared shooters in the league and should eventually receive a contract at or near the max. The No. 4 pick of that draft, Dion Waiters, finds himself in an entirely different situation after three disappointing seasons to start his NBA career. The Cavaliers thought they had their backcourt for the next decade when they drafted Waiters to pair up with Kyrie Irving. Instead, the duo reportedly failed to click on a personal level and never developed the on-court chemistry that the franchise had envisioned. 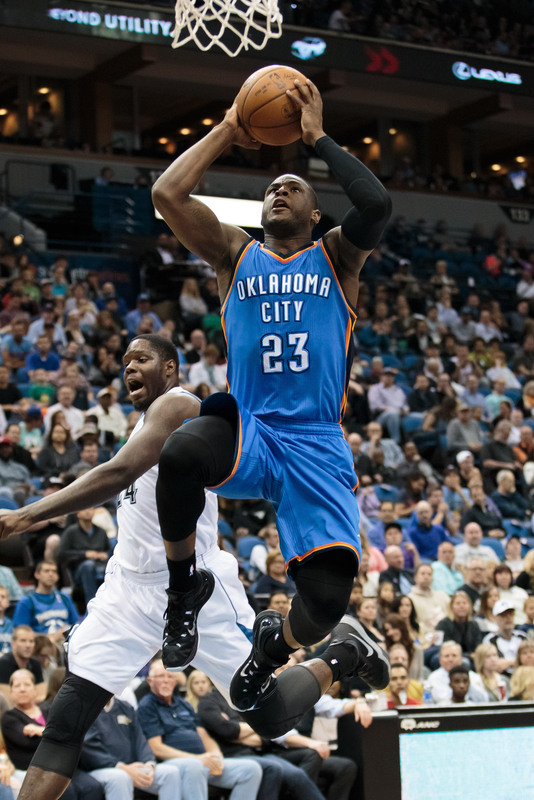 Cleveland shipped Waiters to the Thunder during last season, offering the 6’4” shooting guard a fresh start. While Waiters appeared to be more content with his new surroundings, it didn’t translate to on-court success. He averaged 10.5 points in 23.8 minutes while shooting 40.4% from the field and 25.6% from 3-point range prior to the deal last season. With the Thunder, he averaged 12.7 points in 30.3 minutes while shooting 39.2% overall and 31.9% from long range. He regressed from his second year averages of 15.0 PPG, 43.3% overall shooting and 36.8% on threes. His ESPN Hollinger PER rating of 10.93 last season was well below the league standard of 15.0 and 59th among shooting guards. Other advanced metrics show how much work Waiters must do to improve his game. He ranked 85th out of 91 in ESPN’s Real Plus/Minus rating for shooting guards last season. Waiters’ VORP (Value Over Replacement Player) rating calculated by Basketball Reference was a minus 0.9, compared to minus 0.5 in his rookie season and 0.0 in his second year. His Offensive Box Plus/Minus Rating has been below zero in each of his seasons, including a career-worst minus 2.1 last season. His Defensive Box Plus/Minus Rating was a minus 1.5, though that was actually an improvement over his first two seasons. Waiters can carve out a niche as a volume scorer but he has to be more efficient and take better shots. His midrange game certainly needs some work. He’s taken just 16.2% of his shots from 3-16 feet during his first three seasons, making just 29.4% from 3-10 feet and 41.3% from 10-16 feet. His 3-point shooting needs to at least return to the form he showed in 2013/14. He also needs to create more for his teammates. He had 3.0 assists per game in that 2013/14 season, but that dropped to 2.0 last season. Despite those statistical drawbacks, Waiters has gained a measure of respect from the Thunder organization. They are reportedly willing to give him a rookie scale extension before the November 2nd deadline if he’s willing to offer them a discount. For his part, Waiters has expressed excitement over the hiring of Billy Donovan as head coach and the veteran staff Donovan brought in. Waiters, who will make $5,138,430 this season, believes the new staff will help him expand his game. Waiters should have a prominent role with the Thunder this season, though it remains to be seen how he’ll mesh with a healthy Kevin Durant and Russell Westbrook. Waiters bristled in Cleveland over his catch-and-shoot role, but he’d have a similar role if he’s in the starting lineup with two of the league’s most dynamic scorers. He’d probably be more comfortable as a sixth man with only one of them off the court, which would afford him more scoring opportunities. If Waiters doesn’t accept the discount, he may opt to gamble on having a strong season and then become a restricted free agent next summer. With the salary cap spiking upward, he could get a multiyear offer sheet from an offensively challenged club and gain long-term security, whether or not the Thunder decide to match. It’s an interesting choice, or perhaps dilemma, for a player who has not come close to living up his draft status. 7:37pm: The signing is official, according to the team’s website. 5:00pm: The deal is not fully guaranteed, reports Dan Woike of the Orange County Register (on Twitter). 4:39pm: The Clippers and Chuck Hayes have reached agreement on a one-year deal, a source told Marc J. Spears of Yahoo! Sports (Twitter link). Hayes was set to sign with the Rockets, but that deal fell apart last week. It’ll have to be for the minimum salary, since that’s all the Clippers can give. The deal between Houston and Hayes was reportedly for the minimum with a partial guarantee, though the level of the guarantee on the latest deal for the Calvin Andrews client is unclear. Andrews has nonetheless confirmed the existence of the Clippers deal to Mark Berman of Fox 26 Houston (Twitter link). Several teams had expressed interest in Hayes for coaching or front office jobs, but still only 32, he was focused on continuing his career as a player, as Andrews said last week. Hayes has a chance to keep playing with the Clippers after putting up career lows across the board, including in minutes per game, with the Raptors this past season. Still, at only 6’6″, the undersized center has performed well on the boards during his 10-year career, pulling down 8.1 rebounds in 28.1 minutes per game for the Rockets in 2010/11. The deal with Hayes would appear to complicate the team’s reported talks with Glen Davis and Ryan Hollins, and perhaps its apparent interest in Chris Singleton, too. The Clippers have been carrying 14 fully guaranteed contracts, as our roster count shows, so that leaves room for only one more player on the regular season roster. Whom should the Clippers carry as their 15th man? Hayes, Davis, Hollins, Singleton or somebody else? Leave a comment to chime in. Celtics president of basketball operations Danny Ainge confirmed an earlier report from Steve Kyler of Basketball Insiders that they’ve had talks about an extension with Tyler Zeller, and he said they’re engaged in discussions with Jared Sullinger, too, reports Adam Himmelsbach of The Boston Globe. The negotiations are preliminary, according to Himmelsbach. They, along with offseason trade acquisition Perry Jones III, are eligible for rookie scale extensions between now and November 2nd, but Jones doesn’t appear to be a lock to so much as make the opening night roster, Himmelsbach writes. Zeller is the most likely of the three to receive an extension, Himmelsbach opines. That’s the same sentiment expressed by CSNNE.com’s A. Sherrod Blakely in an earlier report. Grantland’s Zach Lowe speculated recently that the Celtics would extend Zeller as long as the annual salaries are worth less than $12MM. The 7-foot center averaged 10.2 points and 5.7 rebounds last season and shot a team-high 54.9% from the field. Zeller and Kelly Olynyk are the only true centers on the current roster, though Sullinger and David Lee can slide to that spot in smaller lineups. Sullinger averaged 13.3 points and 5.1 rebounds in 58 games last year but has undergone back and foot surgeries, Himmelsbach notes. There are also lingering questions about his conditioning, Himmelsbach adds, though an apparently slimmer Sullinger has been training in Houston with former NBA player and coach John Lucas for much of the summer. Boston’s front office challenged Sullinger after last season to get in better shape. Ainge told ESPNBoston.com’s Jackie MacMullan in March that he would have “great interest” in giving Sullinger an extension, but a weight clause would likely be part of any deal. The Celtics can afford to be more cautious with Sullinger compared to Zeller because they have four other power forwards on the roster. DeAndre Jordan told Relativity Sports agents Dan Fegan and Jarinn Akana last week that he’ll no longer be using them as representatives, a source said to Broderick Turner of the Los Angeles Times (Twitter links). Fegan has close ties to Mavericks owner Mark Cuban, who helped convince Jordan to agree to a deal with Dallas before the center did a 180 and re-signed with the Clippers instead. It’s unclear whom Jordan will hire as his next agent, though he’ll have to wait 15 days to officially make his choice, Turner notes (Twitter link). Fegan and Akana will still receive the 4% commission on the four-year, maximum salary deal worth $87,616,050 that Jordan wound up signing with the Clippers, as Turner points out (Twitter link), but they lose a high-profile client who can hit free agency again in 2018, a few weeks shy of his 30th birthday. They’re not the first agents with whom Jordan has parted ways. The center began with Joel Bell and moved on to the Wasserman Media Group before joining Relativity, Turner recounts via Twitter. Today’s news means Jordan and LaMarcus Aldridge, perhaps the two most talked-about free agents this summer, both changed agents after signing their new deals, as former Nets executive Bobby Marks observes (Twitter link). Aldridge went from Wasserman Media Group to Excel Sports Management, as international journalist David Pick reported earlier this month. Jordan’s move isn’t altogether surprising, given the trappings of the way his commitment to the Mavericks turned into a new deal with the Clippers. Cuban said he was with Fegan while Jordan was apparently in the process of changing his mind, and when Jordan signed his Clippers contract shortly thereafter, it was reportedly Akana, not Fegan, who was present. Austin Rivers, the son of Clippers coach/executive Doc Rivers, also left Relativity this summer, shortly after the agents represented him in negotiations for his new two-year deal worth nearly $6.455MM. Restricted free agent Tristan Thompson, who has reportedly rejected a five-year, $80MM contract offer from the Cavaliers, will not put pen to paper on a new pact unless it is a maximum salary deal, Ric Bucher of Bleacher Report (video link) relays (hat tip to Dan Feldman of ProBasketballTalk). Thompson’s agent, Rich Paul, has already made it clear to the Cavs’ front office that his client is prepared to sign his one-year qualifying offer worth $6,777,589 if a deal can’t be worked out between the two sides, Bucher notes. By signing the qualifying offer, Thompson would set himself up to become an unrestricted free agent next Summer, just in time for the salary cap to increase significantly. One reason that Thompson would be willing to roll the dice and play out the 2015/16 campaign without the comfort and security of a long-term pact is that Paul believes he can wrangle a max deal out of the Raptors next offseason, Bucher adds. Michael Scotto of Sheridan Hoops had previously broached the possibility of Thompson, a Canadian native, joining the Raptors in 2016/17. One Eastern Conference GM had told Scotto that he thought Thompson would end up in Toronto this summer. Thompson is friends with Raptors signee Cory Joseph, who’s also from Toronto. Cleveland is in a difficult position regarding its negotiations with the forward, since LeBron James, also a client of Paul’s, has publicly stated that he wants Thompson to remain with the Cavs, and James is able to opt out of his contract next Summer. Thompson and the Cavs were reportedly close to an agreement on the first day of free agency, but talks stalled when Thompson reportedly asked for $85MM over five years, after it was reported that Draymond Green received that much from Golden State. Green’s actual deal was for $82MM, contrary to those initial leaked figures. Thompson had also turned down a four-year, $52MM extension offer this past fall, betting on the odds that he could do better this summer, despite the Cavs adding Kevin Love to the roster prior to the start of the 2014/15 season. The Cavs do hold Thompson’s Bird rights, meaning that they could outbid other teams for the 24-year-old’s services next offseason. Drafting players is far from an exact science, and many a GM has been second-guessed for his draft night decisions. I’m willing to bet that every team executive has at least one pick that he would like a mulligan for. While life, and the NBA, doesn’t allow for such opportunities, we at Hoops Rumors decided it would be fun to give our readers a second take at picking players, complete with the benefit of hindsight. We are in the process of taking you on a journey back to June of 2003, and revisiting a draft that saw the likes of LeBron James, Carmelo Anthony, Dwyane Wade, and Chris Bosh available to potentially change the fortunes of a few struggling franchises. Wade was the first of that group to win an NBA championship, though James and Bosh would later join him in Miami and go on to win multiple titles together years later, while Melo is still seeking his first trip to the NBA Finals. Detroit, which owned the No. 2 overall pick that season, chose to go with Darko Milicic, who didn’t work out so well for the Pistons. Not all picks pan out, but that one is especially painful given the talent that the Pistons passed over to select the big man, who owns career averages of 6.0 points and 4.2 rebounds, and has been out of the NBA since making a single appearance for the Celtics back in 2012/13. We continue our revisionist history with the Bucks, who used the No. 8 overall pick it had acquired from the Hawks to select T.J. Ford. Readers, you are now on the clock! Cast your vote for Milwaukee’s pick and check back Tuesday night for the results, as well as to cast your vote for who the Knicks will select with the No. 9 overall pick. But don’t limit yourself to a simple button click. Take to the comments section below and share your thoughts on the No. 8 overall pick and why you voted the way that you did. If you’re a Trade Rumors app user, click here. Sir’Dominic Pointer, the No. 53 overall selection in the 2015 NBA Draft, will join the Canton Charge for the 2015/16 season, Chris Haynes of the Northeast Ohio Media Group reports. Canton is Cleveland’s one-to-one D-League affiliate. The 23-year-old will not attend training camp with the Cavs and instead will report to Canton once its training camp commences, Haynes’ source informs him. It’s a wise move for the young guard, with the Cavs already possessing 13 players with fully guaranteed deals. It would be a long shot for Pointer to make the final cut and stick on the NBA roster for the regular season. Cleveland is reportedly intrigued with Pointer’s size (6’5″) and defensive skills, and the franchise sees him potentially developing into a lockdown defender who can guard multiple positions, according to Haynes. Bypassing the NBA for the D-League next season is viewed as the most logical path for both the player and the team given the Cavs’ perimeter depth and Pointer’s need to improve his shooting, the Northeast Ohio Media Group scribe adds. Pointer averaged 13.7 points, 7.7 rebounds, 3.0 assists, 1.9 steals, and 2.4 blocks as a senior for the Red Storm during the 2014/15 campaign. His career NCAA numbers are 8.3 PPG, 5.2 RPG, 2.3 APG, 1.5 SPG, and 1.3 BPG to accompany his shooting numbers of .477/.193/.681. In five summer league games for Cleveland’s squad he averaged 5.6 points, 3.0 rebounds, 1.4 blocks and 1.0 steal in 18.4 minutes per game.